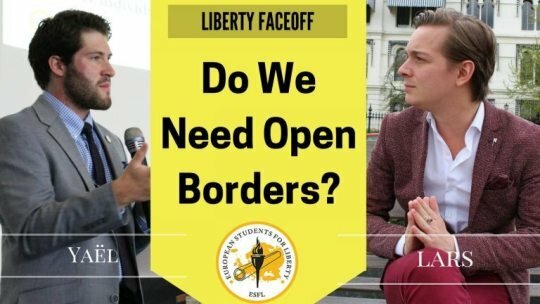 In this Liberty Face Off, Yaël Ossowski and Lars Benthin discuss open borders: Do we need open borders? And do open borders enhance our freedom? A free society is one in which people are free to come and go as they please and are treated as individuals rather than members of a group or tribe. It’s an ideal we uphold in much of the western world, and we generally practice it at our nations’ peripheries, albeit with certain caveats. It’s no mistake that the most totalitarian states in the world have the strictest border controls while countries which have more freedom tend to be more relaxed. And it’s because of this positive system that I argue that we need open borders. For the sake of our economies, our freedoms, and our own well-being. That being said, favoring open borders doesn’t mean no borders. It’s a door that remains open in good times, but can be closed in bad times. We don’t allow in folks who are connected to terrorism. Nor do we allow those who haven’t proven they can sustain themselves during their stay. Endorsement of open borders doesn’t lend itself to letting in the bad guys or a nation neglecting its duty to keep its people safe. However, we need a system of open borders if we seek a society that values a free market and a limited role of the state. Free movement of goods cannot be achieved without also a free movement of people. It is due to this paradigm shift that Europe’s young people again have a chance to live freely and in peace. This exists because of the free trade and free movement zone known as the Schengen Area. Now over 20 years old, it has not only brought humility back to cross-border migration, but it has spawned a generation of open trade and commerce to open up economies and make markets more efficient and beneficial for all. Goods and people flow across the borders of European states, unhampered by state intervention. It’s made the combined European economy the largest in the world. Such an experiment is one to celebrate, not bemoan. Critics would like to point to problems of social integration as an argument for restricting the movement of people across our borders. But the freest borders in the world show us these concerns are muted. There are free trade and free travel agreements between Australia and New Zealand (Trans-Tasman Act) and the United Kingdom and Ireland (Common Travel Area), which have been mutually beneficial for decades. The model of 50 states cooperating in open trade and migration in a union has made the United States one of the most powerful countries in the world. It’s been one of the greatest experiments of open borders and free immigration since the late 1800s and early 1900s, but always with rules and stipulations. Disease and crime were riddled out at Ellis Island on the East Coast and Angel Island in the West, which processed millions of immigrants over the course of several years. Despite the fear about Catholics, Jews, and even the Irish, these millions of people immigrated to the U.S. and integrated rather well. If countries around the world took this approach of more open borders, then we’d be better off for it, and more free. Open borders and immigration are the most controversial topics in libertarian circles. That’s because identity and globalism are becoming the most important issues in public debate. When it’s about open borders, left-libertarians accuse the right-libertarians of fascism and right-libertarians accuse left-libertarians of communism. That’s ironic, namely because fascism and communism are both extremes of the statist spectrum. In fascism culture is a central theme and in communism everyone is united in being human, not in culture. This debate about open borders isn’t only about arguments regarding the economy. When the demand of labour is higher than the supply, immigration through open borders is an important factor in fulfilling that demand. But in the last 60 years, arguments regarding immigration have always been about the economy, not about identity or culture. The reason behind this phenomenon is that the development of globalism is at a critical point in our history. The friction between cultures confront us (libertarians) with a choice between two options: we accept the rise of a ‘global culture’ or we accept the fact that differences in cultures are important aspects of the human kind. If you look at my choice of words it comes as no surprise what I will choose. I don’t understand that libertarians refuse the importance of culture in human life. I defend individual liberty and I see economic and social liberties as the most important aspects of society and individuals. But what about culture? We, libertarians, believe in spontaneous order and solidarity based on free will. But isn’t culture an important aspect of that spontaneous order? The combination of social rules, religious belief and preferences of certain goods and services, is a part of culture. Individuals don’t live by themselves with no relationships or interactions with other people. Humans are social beings who feel at home in a certain kind of setting or context. Collective (yeah scary word, but not in every context) identities are made of individual identities and individual identities have aspects of collective identities within them. To deny that principle is to deny a realistic view on human relations and human nature. When culture changes too much, people could feel alienated within the context they lived for years. At this moment, some libertarians would think: individuals can change too, nothing will be the same forever! That’s undeniably true, but who are others to force an individual to accept those changes? With immigration comes changes in the collective culture. The magnitude of that change depends on the amount of immigrants coming into society and the fundamental difference between the domestic culture and that of the foreigners. Some cultures are more authoritarian than others, or more religious (did I already say authoritarian? ), that’s a fact. The more immigrants with a fundamentally different cultural background come into society, the more the collective culture changes. A simple example: a culture that loves individual freedom may become a collectivist culture when immigration from authoritarian cultures becomes too large. Is that something we’ll just have to accept for the sake of open-borders? Destroying our own freedom? There are many aspect about open borders, immigration, integration and libertarianism. This article was about the aspect of culture, which libertarians, in my humble opinion, disregard too easily. Sure, in a utopian world where nations don’t exist people would have the freedom to migrate to other societies which closely resemble their cultural or religious preferences. Sadly, we don’t live in that world (and in my humble opinion that will never happen) so we should focus on those societal and cultural differences and their consequences.